The Boston Globe has a wall displaying every Instagram picture posted in the local area and is using it as a source for stories – such as to discover the sharing of photos by some people in Boston of their daytime drinking during a day off post-Hurricane Sandy. The wall, which is a result of a partnership between the Globe and the nearby MIT Media Lab, provides an "interesting glimpse" of the city and the shared images are "trickling into its journalism", Chris Marstall, creative technologist at the Boston Globe said when we caught up with him at this weekend's Mozilla festival 'MozFest'. 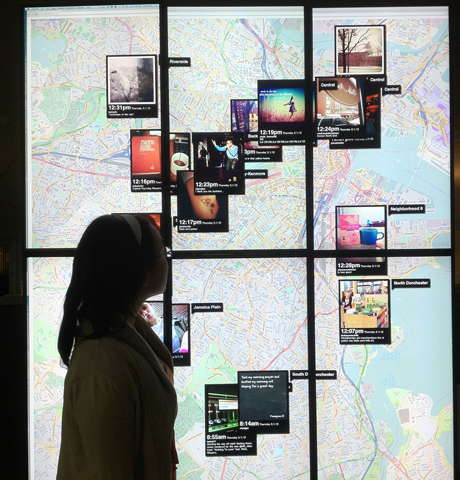 The wall, which is called Snap, has been displaying a visualisation of real-time, geocoded Instagram posts super-imposed on a map of Boston since its creation in the spring. Snap is "in a very prominent area near the newsroom" and a product of the Boston Globe's innovation lab called Globe Lab. Grace Woo, who developed Snap along with Anthony Paolillo, beholds her work. Marstall explained that the Instagram wall provides an interesting perspective on the city. "You really see a lot of different interesting things," he said. "You see different kinds of activities in different parts of the city; you see different races, different ethnicities, different age groups, and you see different stuff happening at MIT than you see happening in Beacon Hill," Marstall added. "It has also trickled into our journalism as well in a couple of interesting ways," he said, and provides the Globe with very different photos than those resulting from those submitted after a call out from the news title. "These are photos that are relatively intimate at times; pictures of the inside of people's houses, pictures of their loved ones, pictures of their pets, pictures of their casual activities that are often more revelatory and more personal than the kind of photos you would see on Flickr or Twitter. "They are not really event-based, they are just things like 'I just had a delicious meal, look at my cocktail' or 'look at my new nail polish'. And people love uploading pictures of their nails on Instagram, we've discovered." "It's really been an interesting glimpse, kind of virtual drone journalism, to be able to look into people's houses, into people's lives." The Globe has carried out two specific Snap projects so far: one was a long-term project on the portrait of a neighbourhood, Marstall explained, and the second was a story that came out of Marstall monitoring the wall after Hurricane Sandy struck. Boston suffered the outer reaches of Sandy but was less affected than New York, which is four hours' drive away. "An editor emailed me when Hurricane Sandy hit Boston and said 'why don't you see if you can look at what is happening on Instagram and find a story?'" Marstall then spent "about eight hours staring at Snap". At that stage Marstall did not know what the story was. "Eventually I figured out that the interesting story to tell was that everybody was staying home and getting drunk in their apartments, doing a lot of day drinking," he said. He ended up writing a "fun blog post that went a little bit viral" which included Instagram pictures of people holding up bottles of whisky and cocktails, using the time off work to drink with their flatmates. But how does the Globe approach permissions and the question of publishing intimate images that have been posted by Instagrammers, unaware of the Snap wall? Martsall said it is something the Globe team has "struggled" with. "As an organisation people walk into the lab and say 'we need to get this on the website', but we don't really feel like we can post from photos unless we have the rights," he said. As there is no easy way to message Instagrammers, the Globe's workaround is to leave a comment on the picture (using Webstagram), providing an email address for the Globe. "We've iterated on that," Marstall said. "It started out with a bit of an official tone, which didn't work at all, and we've become much more personal." Contacting the person who posted the photo "adds a lot of value", he explained, as it provides an opportunity to ask more about the picture and the response can give "a great caption". Requesting permission can delay the story, however. When asking for permission to post the daytime drinking pictures, Marstall received responses from less than half of those he contacted, with another couple of people responding after the deadline. He also "experimented with different ways of trying to phrase the comment" and ensured he always 'liked' the photo and 'followed' the person on Instagram. Asked if the question of payment for the use of images use has ever been asked by an Instagrammer, Marstall said it has not so far. You can hear from Chris Marstall in the interview below.